Fourteen anti-war activists may have made history today in a Las Vegas courtroom when they turned a misdemeanor trespassing trial into a possible referendum on America’s newfound taste for remote-controlled warfare. 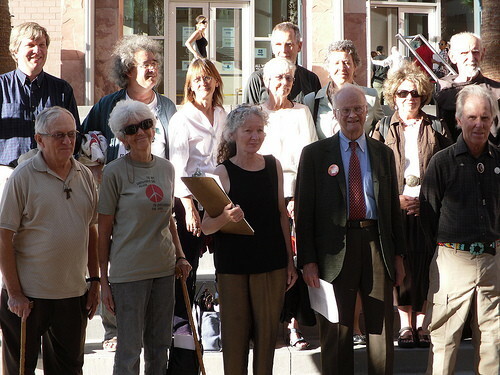 The so-called Creech 14, a group of peace activists from across the country, went on trial this morning for allegedly trespassing onto Creech Air Force Base in April 2009. From the start of today’s trial, prosecutors did their best to keep the focus on whether the activists were guilty of allegations they illegally entered the base and refused to leave as a way to protest the base’s role as the little-known headquarters for U.S. military operations involving unmanned aerial vehicles, or drones, over Afghanistan, Iraq and Pakistan. But a funny thing happened on the way to prosecutors’ hope for a quick decision. By the time those three witnesses finished their testimony as to why they believed the activists had protested at the base, they’d managed to convince Las Vegas Township Justice Court Judge William Jansen to delay his verdict for four months — and had managed clearly to frustrate prosecutors. For the better part of the day, Clark, Wright and Quigley testified under direct questioning from witnesses and a surly cross-examination from the Clark County district attorney’s office. Each witness spoke eloquently, and at length, about the need for nonviolent civil disobedience in the face of criminal actions by the U.S. government — which is how most in today’s anti-war movement and many international observers have characterized America’s drone war. “[People] are allowed to trespass if it’s for the greater good — and there are certainly exceptions [to the law] when there is an emerging, urgent need,” said Quigley, while on the stand. of the Center for Constitutional Rights. disobey domestic orders that cause crimes against humanity. Defendant Brian Terrell delivered the group’s closing statement. Terrell; Eve Tetaz; Fr. Louie Vitale, OFM; and Fr. Jerry Zawada, OFM. I received an education yesterday. I wasn’t in a classroom. I wasn’t laboring over a paper, strategizing in a small group, poring over a textbook or hustling across campus. I was sitting as a spectator in the front row of Judge Jansen’s courtroom in Clark County, Nevada. “Fourteen anti-war activists may have made history today in a Las Vegas courtroom when they turned a misdemeanor trespassing trial into a possible referendum on America’s newfound taste for remote-controlled warfare.” That’s how one Las Vegas newspaper summed up our stunning day in court on Tuesday, when fourteen of us stood trial for walking on to Creech Air Force Base last year on April 9, 2009 to protest the U.S. drones. For more information visit the Nevada Desert Experience and Voices for Creative Nonviolence websites.